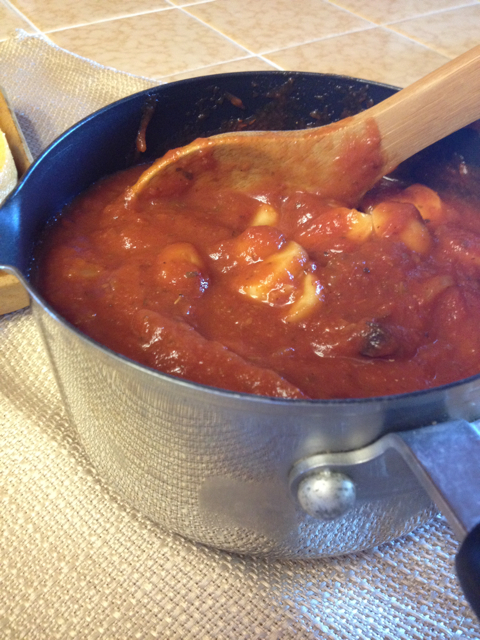 My Real Italian Kitchen: Polenta and Sauce | Frankly, My Dear . . .
WinCo is still one of my favorite places ever. My last two grocery shopping trips stocked my pantry so thoroughly, I’ve not been back for well over a month. 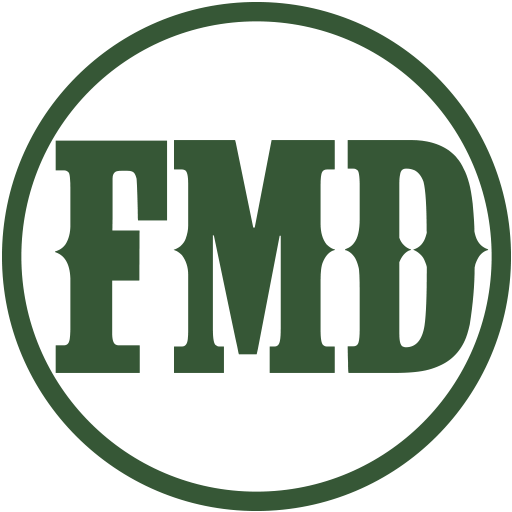 When you’re on a budget for time as well as money, that’s a big deal. 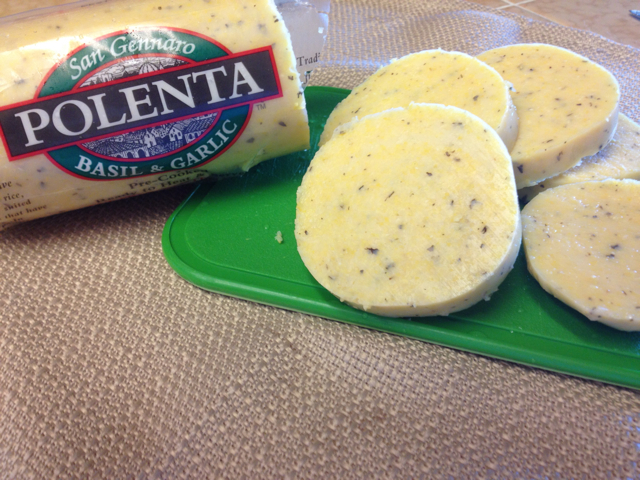 Last month, I picked up a tube of ready-made polenta, with absolutely no idea what to do with it. It stared at me from the refrigerator drawer every morning. It begged me for attention every evening. I still wasn’t sure how to prepare it. Luckily, WinCo directed me to their polenta recipes on their website, including how to make it from scratch. I also searched the internet for other creative cooking ideas. Polenta is an Italian cornmeal that can be made into a porridge, or sliced for baking or frying. As a porridge, it’s a delicious breakfast or side dish. You can slice it extra thin to add to your deli sandwich. Fried or baked, it can replace pasta or rice for an easy lunch or dinner. It’s even a great mini breakfast when topped with maple syrup. The Polenta I picked up was already seasoned with basil and garlic, so that ruled out a breakfast porridge. 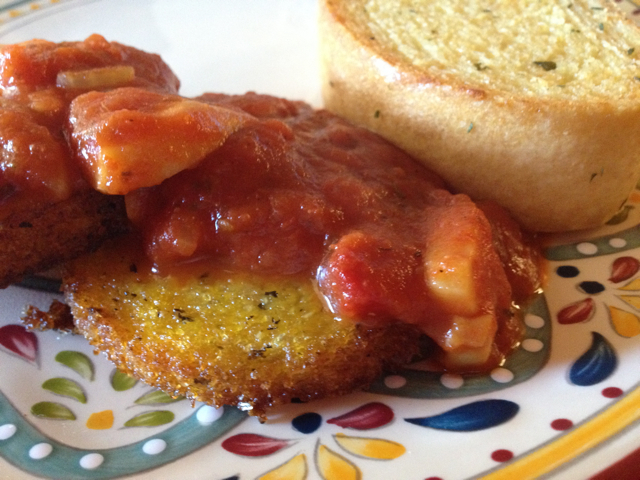 For my first experience, I opted to slice and fry the polenta on my stove, and top it with a blend of pasta sauce fortified with additional spices and an extra can of sliced mushrooms. I began by slicing the tube of polenta into 1/2-inch round slices. My favorite pasta sauce is Newman’s Own Sockarooni. It has the perfect balance of seasonings and vegetables. I often add browned ground meat to the mix, or serve it over meatballs. For this polenta dinner, mushrooms were the extra touch. While the sauce simmered, I heated up my large frying pan with about 1/2-inch of olive oil. 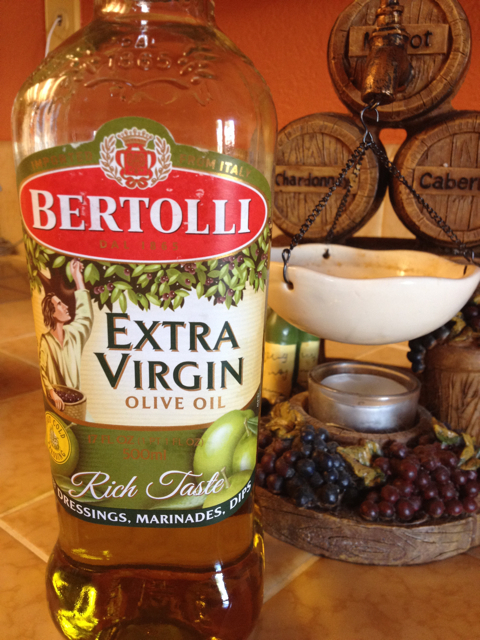 Of course, Bertolli Extra Virgin Olive Oil is my favorite. It has just the right blend of natural oil and flavor without a heavy, greasy taste or feel. Once the oil was nicely heated, I carefully placed the polenta slices in and covered them to minimize splattering. After five minutes, it was time to fry the other side. This was tricky, because even though I love being in the kitchen I’m not a big fan of cooking with a lot of hot oil. I managed to flip the polenta with very little mess, and after another five minutes of covered frying, I transferred it to a paper towel to absorb the excess oil. In just two more minutes, dinner was ready. 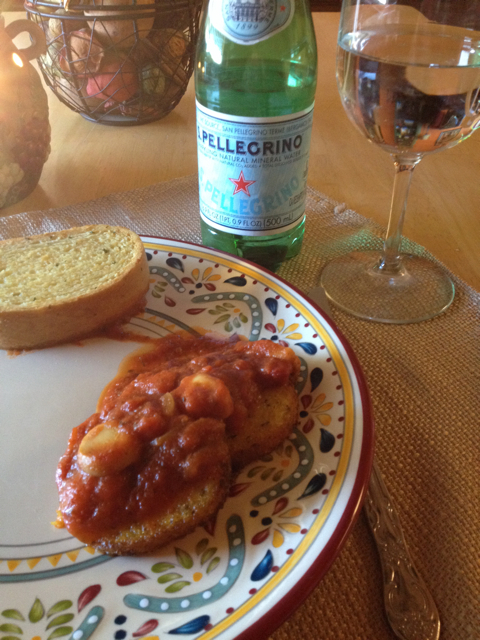 Served with a simple slice of garlic toast and a refreshing Pellegrino water, my Italian dinner was complete. That’s an approximate $2.75 per plate. Not bad for a delicious Italian meal. 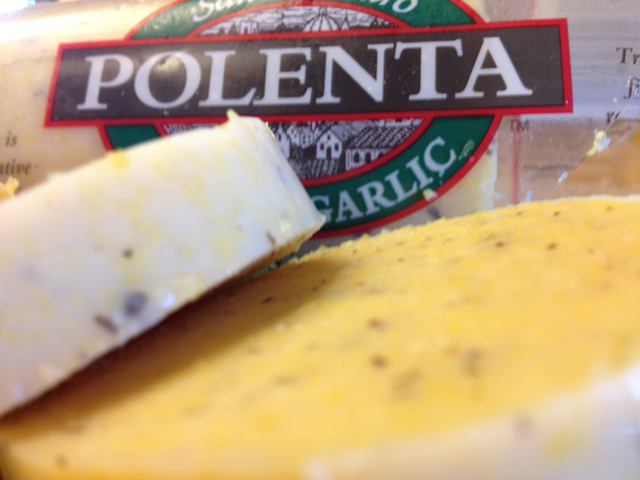 Polenta is so versatile in both flavor and use, no wonder it’s the food of choice for Northern Italy. And, in My Real Italian Kitchen. WinCo Wins: Lunch for a Dollar! Oh, so that’s what it is. I’d heard of polenta before.